A pair of fantastic hidden object and match-3 adventures together for the first time! The Better Together Bundles bring you two great games that play even better together! This bundle includes the following games. Jewel Quest Mysteries 2 - Trail of the Midnight Heart: Uncover relics in eye catching hidden object screens. Unearth tools that will help you reveal shards of the precious jewel boards and discover all new scrolling search screens that put you in the front seat of whizzing planes and a whirlwind adventure. Jewel Quest Mysteries 2 is a hidden object adventure like no other! 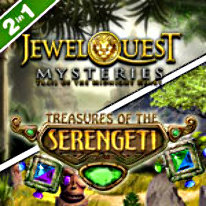 Treasures of the Serengeti: Join Asha, a young tribal shaman, on a unique musical quest where match 3 and jigsaw puzzle collide in Treasures of the Serengeti. Collect precious gems to rebuild her once thriving village. With 7 original African-inspired soundtracks and 9 interactive musical mini-games, you will get your match on to a lively beat of the drum when playing Treasures of the Serengeti.